I love when we get to do matchmaking. My colleague Jay and I were preparing to bring this listing to market, when an out-of-state buyer of mine came into the picture: a retired couple from Vermont relocating to be near their grandchildren. 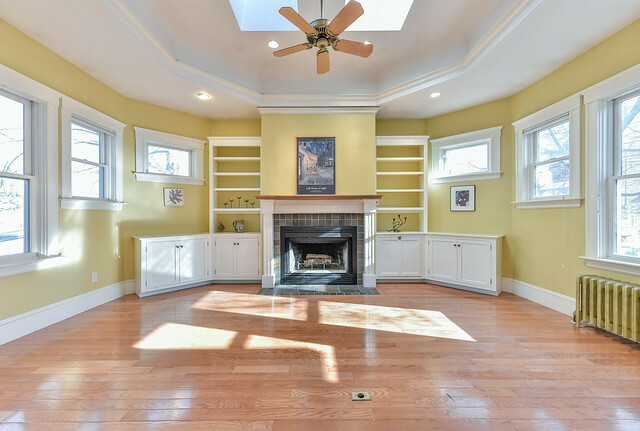 As they pondered their transition from rural Vermont farm life back to the city, I realized they needed to see this special home in Roslindale’s Parkway neighborhood. Quaint and seemingly modest from the street, the home is expansive, and its corner property has the width and depth of two house lots—more than half of it steeped in greenery. My buyers love dogwoods; this house has two. Plus towering cypresses, a Japanese maple, an American cherry, blueberry bushes and grapevines. The view from the upstairs master bedroom and top-floor studio show Boston’s skyline in the distance, set against old-growth trees and obsessively tended perennial gardens in the foreground.